Biofuels - The Optimal Second Best Solution? How Efficient are Hydrogen-Fueled Internal Combustion Engines? The large evolution of the energy consumption during the last century is correlated with the development of large cities, a strong increase of the human transportation and the large exchanges of mineral and food resources. At the same time, the large part of the energy that is needed is produced by combustion systems, which give us a very flexible energy freedom, while the storage is just connected with the extraction of fossil carbon sources (oil, coal or gas). In 2008, the European Economic Community opens a new challenge by the European Energy set plans (20 % of ENR, 20 % of increasing energy efficiency, 20 % of carbon dioxide capture) in order to open the way for sustainable development concerning energy resources. Despite the energy production losses of about 60 % of the energy content of the primary sources, and in any way the second law of the thermodynamics point out the technical difficulties of energy efficiency, this new management is starting with more complex industrial processes which open the field for “green energy processes”. The feeling of this new management of energy sources is built on energy and mass balance of the process in order to measure firstly the energy efficiency, but at the same time also the byproducts of the process such as ashes, carbon dioxides, HAP, nitrous oxides, sulfur oxides, heavy metals, mercury…, and at the end the water energy consumption of the process for each MWh produced. By doing so, the real cost of a new process is clearer, because it takes into account at the same time both the energy production and – in agreement with the European regulation – the recycling wastes and by-products. Besides hazard effects, the impact on health can also be identified, so that we can speak about green energy processes. Taking into account the evolution of the energy sources for sustainable development, we have three kinds of energy: fossil carbon resources, which are limited but give us a very flexible energy storage, due to the high level of energy content by liter of raw material, renewable energy (solar, wind, geothermal sources, biomass) and nuclear energy sources (U235 fission or H2 fusion in the future). All of these are developed but we have to point out the large difference in term of financial cost (CAPEX), management and utilities, flexibility, waste treatment, recycling, energy storage, power size, and electrical network and social agreement. The future of our civilization needs a large creativity supported by a strong engineering education to manage the mixed energetic network. The sustainable energy concept has to take into account all the best working new processes but at the same time the water consumption, the climate, the human activities, the industrial development and the agricultural techniques. That is why this book opens three parts to give an overview of energy efficiency and environmental impact, renewable energy and energy for transportation. The first part is mainly focused on environmental processes, including hydrogen and heavy oil sources and allows us obtaining the leading knowledge for a better efficiency of the processes. The second part is about renewable energy sources such as solar, wind, and biofuels. It is focused on the large development of wind turbines, photovoltaic techniques, thermal solar techniques, and presents the large plants which are built to day around the world. However, the question of the energy storage and the flexibility of these nanotechniques need more development to explain how to develop a mixed energetic network for a continuous energy demand. At last the biofuel is one of the more complex energies: in one way, we have large sources of biomass from wood, by product of agricultural activities, algae and animal waste, but today the main industries working in that field use corn or sugar which are in competition with food resources. The last part is about energy for transportation, we have to remember that it represents 40 % of the energy consumption and controls the international trade. The evolution of the efficiency of energy from 20 to 40 % is one of the technical developments, with the new synfuel from FT, hydrogen, fuel cells. It is an evolution for the transportation process which is starting. So, that the field of “green energy technology” be the starting point of creativity for those who enjoy to work in the field of new technologies. This new book presents recent developments, state-of-the-art and progresses in the field of energy where efforts are done in order to improve the usability of energy systems, reducing their environmental impact. The book aims at providing researchers, academics, engineers and advanced students information and points of discussion, a platform for future improvements in green energy. Both theoretical and applied aspects are treated in this book. Many illustrations and mathematical equations as well as practical on-the-field applications are incorporated. This book aims at contributing to the increasing interest in reducing the environmental impact of energy as well as its further development. Three parts are considered. The first part treats different energy applications and the efforts that are done in order to improve their impact on the environment. It deals with bio-energy, well-to-wheel analyses and heavy oils. Concerning bio-energy, the costs are evaluated under strict regulations imposed by a climate stabilization target, where a certain case is taken as example. The well-to-wheel energy analyses take into consideration a comprehensive study on greenhouse gases and certain criteria that concern the emissions in the case of hydrogen based fuel-cells. The second part deals with different kinds of renewable energy sources. 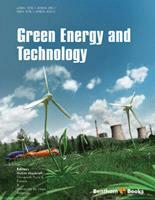 The chapters discuss bioenergy, wind energy and solar energy. The use of biofuels is critically discussed. A real application and evaluation of wind energy is presented, by means of designing and optimalizing a wind power system. A detailed discussion about the generation of electricity by means of different kinds of solar energy is performed. The third part puts emphasis on alternative energy processes for transport utilities. In this part, is discussed, amongst others, the Homogeneous Charge Compression Ignition combustion mode. Advantages and inconveniences are proposed. Wide and comprehensive studies on this combustion mode are presented. Both a large synthesis of available work and experimental results are used in an effort to discuss these advantages and inconveniences in order to propose possible solutions. Some examples are treated elaborately. Hydrogen-based combustion is discussed and its efficiency evaluated in detail. Elaborate studies and examples give a rather complete vision of the probable use of hydrogen in internal combustion engines and the different aspects that are to be examined are treated in detail. The commercialization of fuel-cells are investigated, giving trends and possible developments that can be envisaged. Finally, a philosophy of controlling the auto-ignition in an HCCI engine is presented. This philosophy is somewhat general and the outlines can also be used for the abovementioned transportation modes. A rather general overview is given in this book, starting from different visions on reducing the impact of energy on the environment (green energy) and continuing on how this can be achieved (green technology). The different results and the available literature that is treated in various chapters in this book show that many researchers are investigating the efficient use of energy whilst looking for ways to decrease its impact on the environment. This shows the importance of such research and the work that remains to be done.